Our second visit to the obstetrician’s office. Doctor applies the ultrasound gel as usual, and then starts moving the thing around. He goes back and forth for a few moments without saying anything, and then.. I honestly thought he was joking. ZERO family history. Not even a scenario we had considered or worried about or planned for. Why would you? Zero family history! “Well, history has to start somewhere, so now your family will have history”, smiles the doctor. So on the 28th of May 2016, we learned that identical twins CAN happen without any family history. Doctor went on to explain that they were mono-zygotic, di-amniotic twins, which is a fancy way of saying 1 ovum split into two around the 4th to the 8th day after conception, sharing one placenta but each in its own amniotic sac. Advanced maternal age (over 35) – Nope, I was 26. Tall height – Nope, pretty short just pushing 160cm. I prefer telling people I’m 160cm, it sounds so much taller than 159cm and really, who can tell the difference? White/African – Apparently race is a factor. Those dang racist splitting eggs.. and no, I’m Chinese, which has one of the lowest risks for multiples. Hereditary – None at all. Multiple pregnancies – Nope, first time. SO. I was in the lowest risk category for every single risk factor for having multiples. 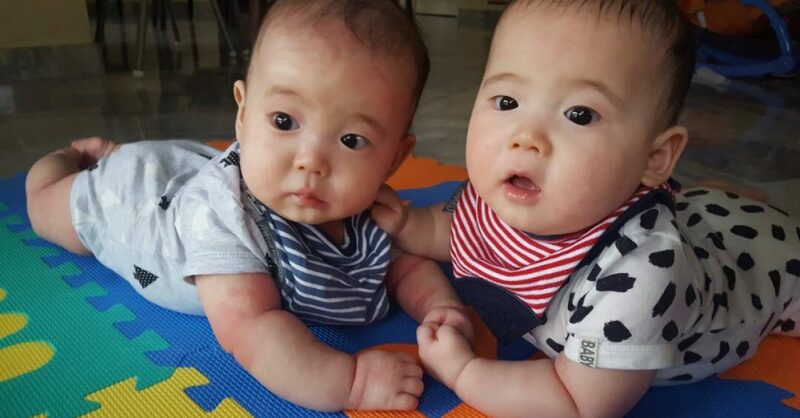 According to Babycenter, the likelihood of having identical twins is only 3-5 out of 1000 births. Figures, I’ve never won a lucky draw in my life – now I know where all my luck went!